I had a good sized bag of apples from my visit to the apple orchards a couple weeks ago and decided to do a muffin for today using up an apple or two. This is a very tasty muffin recipe perfect for fall - the crumb topping makes it extra special (and extra messy)! I like the texture from the oats in the topping with the tender muffin beneath. Just the right amount of sweetness. I found these to be a tad on the mild side in terms of flavor - so suggest adding a tsp of cinnamon to the batter (which I added to the recipe ingredients below). Happy fall! Have a wonderful morning browsing through these delicious recipes! Preheat oven to 350°F. Spray a 12-cup muffin tin with baking spray (I used my Pampered Chef Brownie Pan - hence the square muffins!) Set aside. Grate the apple and set aside (I left the peel on, peel if preferred). In a large bowl, combine the brown sugar, eggs, vegetable oil, and vanilla extract. Fold in flour, baking powder, baking soda, cinnamon, and salt. Fold in shredded apples. In a separate bowl, combine crumble ingredients - brown sugar, flour, oatmeal, cinnamon, and a pinch of freshly grated nutmeg. Use a pastry cutter to work in butter until texture resembles a fine sand. 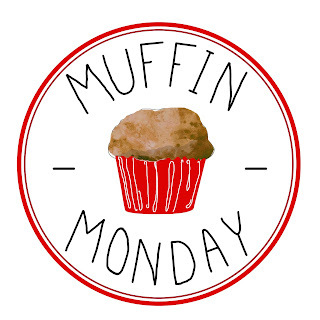 Scoop batter into muffin cups, spreading evenly between 12 muffin cups. Crumble oatmeal topping over batter. Bake muffins for 20-25 minutes, then allow to cool sightly before serving. Oh yeah....this crumble is making me swoon, Rebekah. Your crumble topping is perfect for apple muffins, Rebekah. Like apple pie but so much easier! This year we have a local apple share and each week when I bring home a big bag I think I'll do something with them . . . but then we just eat them because they taste so darn good! I love the square shape of these muffins--great idea! I love that crumb topping. But I really really love your square muffin pan. #Choctoberfest ~ Thank you Barleans! #Choctoberfest ~ Thank you Caveman Coffee! #Choctoberfest ~ Welcome and Giveaway!